My wonderful son Ezra has been getting up at 5:30 a.m. ALL WEEK LONG and waking several times at night. No apparent reason- he’s happy upon waking and doesn’t seem to need anything. But at 5:30 he is up for the day. The very long day. 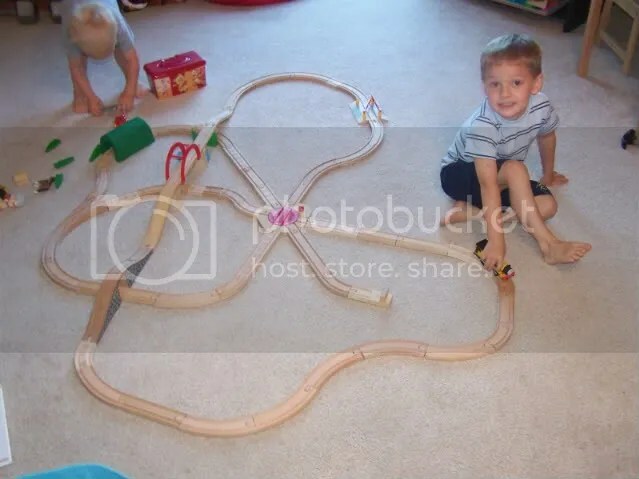 There has been a lot of train building going on around here. The formations change almost hourly and both boys have their own ideas about how things should look. It’s been quite the exercise in sharing and teamwork! I’m starting to read more about Reggio Emilia and project-based learning. If you want a place to get started Camp Creek is amazing. I’ve been reading there all week long along with otherReggio blogs. I’m going to have to go back and revise my Educational Influences post from last week! We’ve had some hard news about Superman’s job. The short story is that the new contract is changing from 6 days with 10-12 hour days to 7 days with 12 hour days. Anyone who refuses will have their contracts pulled. On top of that this fall is his senior year and to graduate he’s taking 5 classes fall semester and 6 classes spring semester. He was having a hard time with getting his coursework done since they went to the mandatory 6 days a few months back, so now it will be nearly impossible. So we’re praying and Superman is looking for a new job. Ender started his first project- animals. We have had plans to go to the zoo this morning all week long and when I reminded him of that last night he asked if he could take a clipboard and paper. I told him that was fine and he ran to pack it- he said he wants to write something down at he zoo. I’m curious to see what it is! I’m sure that will be the subject of a post to come. The boys watched the movie Ice Age for the first time this week. Ezra is obsessed with Scrat. He laughs hysterically every time that little rat/squirrel comes on the screen and he gestures frantically and cries “Cur! Cur!” (squirrel! squirrel!) and then laughs again. He thinks real squirrels are hilarious too. I’ll be offline much of the weekend working on projects, cooking and eating good food, and trying to convince Ender that fireworks are pretty to watch. We’ll see if this is the year he can handle the noise.